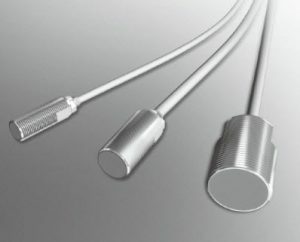 FL7M Series DC-2 wire No Polarity Long Distance Cylindrical Proximity Sensors. The FL7M DC-2 wire no-polarity cylindrical proximity sensors have longer sensing distances than the standard reduce wiring costs and errors. They have a highly waterproof rigid structure with an improved visibility indicator lamp with a firefly glow that can be seen from any direction. Features include low current consumption (0.55 mA), sealed to IP67G, and rigid housing to withstand higher mounting torque.